First of the the term "free" can be slightly deceiving since it can also cover "selectively free" parts. 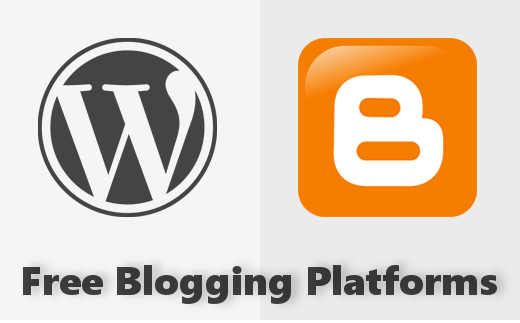 But let's keep it simple, we are here to look into "Free Blogging Platforms" and that's it. We don't want to pay anything under behind or anywhere else. Completely FREE! I am going to cover free blogging services and free hosting services in case you want a certain different site. Then again this list will only include the free ones. Hands down. I believe this is the best free blogging platform available to anyone and everyone. Owned by Alphabet formerly Google, they're the same right. Anyways, Blogger is a free blogging platform which gives you unlimited storage and unlimited visitors for your site. You don't have to worry about anything like whether you have enough bandwidth, what if I start getting alot of visitors? There is absolutely nothing to be worried about when using Blogspot as long as you follow their guidelines which are pretty straightforward and easy to understand. Now you can use Blogspot to make a family safe blog or not-so-family safe blog a.k.a Adult Blogs. But I would recommend skipping Blogger if you have an Adult website in mind. Sign up for Blogspot here. You can also setup custom domain like I have done from here. It's WordPress.com and you have probably heard of it. WordPress now runs 27% of the website as stated by them which is quite apparent. Everything with WordPress.com is fine there is alot to customize compared to Blogspot. Only problem which might arise in future for anyone opting WordPress is the storage allowed for the Free account. Now I'm not saying it's not worthy. In fact if you end up covering the 3 GB free space given by WordPress your site must be going somewhere. So at that point you can switch to paid accounts. Tumblr is like another form of WordPress.com. It's slightly easy to use and that's because there is not much to customize comparatively. Only flaw with the tumblr is that they run their ads on your blog, which makes it "free!". Beside all that you can easily gain popularity through tumblr since there are a lot people out there visiting each other's tumblr blog. I personally don't like tumblr because it gives a feeling of just another social network. Sign up for tumbr here. Wix has been around for many years now. But it's just like a simplified version of WordPress.com. Plus their free accounts does not give much either. You can check their free and paid comparison here. They even run their ads on your blog and just 1 GB of bandwidth which you will run out with just 100-200 visitors. I'm a big fan of this service. Although the features they provide for free account aren't much, but they are actually giving free web hosting no strings attached. You can disable their ad. They have website builder for WordPress. What else do you need? Sign up for 000webhost account here. In case you are not sure how to begin with, you can follow my small article on 000webhost here. Now apart from this, there are services like Ghost, squarespace which aren't really free. And services like postach.io, medium, svbtle, livejournal are either too simple or too much like another social network disguised as "Blogging Platform". The meaning of the term Blogging has drifted from what it formerly meant. Blogging is not Social Networking. Blogging is about delivering original content and sharing your own perspectve.